Now that we are getting into the warmer time of the year we need to keep an eye on our most predominant turf damaging bug the chinch bug. Chinch bugs usually get started in the sunny, dry parts of your lawn. You wanna keep an eye off of your driveway and sidewalks. Chinch bugs can cause real damage to the grass leaving the St.Augustine grass slow to recover. As your lawn care company it is our job to properly treat for this bug. 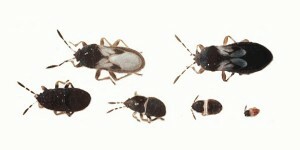 Chinch bugs have several generations throughout the year. The chinch nymphs (babies) are layed in the sheath of the grass blade making them harder to be treated. So we will always need to keep an eye out for them. There damage is very noticeable as the grass blades will die off creating a reddening appearance and some blades yellow out. At AssureGreen we will do preventative treatments to stop there damage before it begins. Here is a picture of chinch bugs. To find them you can just look in the area that is beginning to brown and the green area.